I like Frank Delaney’s style of writing. It’s different and undoubtedly quirky, but somehow perfect for an Irish tale. I can hear an Irish lilt as I read it. The Last Storyteller is the third book in a trilogy that began with Venetia Kelly's Traveling Show followed by The Matchmaker of Kenmare and it brings to a close the story of Ben MacCarthy and Venetia Kelly. Ben’s mentor, James Clare once told him, “There’s no story, no matter how ancient, as important as one’s own. So if we’re to live good lives, we have to tell ourselves our own story. In a good way. A way that’s decent to ourselves.” Ben is now an old man doing just that - writing a family memoir, his own story, for his twin children. “Gentleman Jack” Stirling is involved so hires thugs to kill Jack. He feels instant remorse and regret. 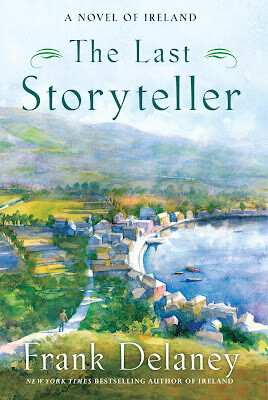 Ben becomes an apprentice to the last storyteller, John Jacob Farrell O’Neill. Ben says of their time together, “I was relearning life.” He receives details about being a successful storyteller and embarks on his new profession of travelling around Ireland telling stories. Gradually he overcomes his feelings of guilt and anguish and learns to understand himself. As in all of Frank Delaney’s books we learn something of Irish history, Irish politics, Irish customs and ways….always bittersweet, but done with humor and warmth, although with liberal use of religious expletives. If you have read the two previous books you must read The Last Storyteller to see how Ben and Venetia’s story ends. Even if you haven’t read the earlier books, this can be a stand-alone novel. And, oh my goodness, the epilogue! Un-put-down-able! Frank Delaney pulls all the threads woven throughout the three books together into a satisfactory whole. He is truly an exceptional storyteller. This book is rated P = Profanity for religious expletives. Disclosure: Thanks to Random House for sending me this book for review. I was not compensated in any other way, nor told how to rate or review this product.